A case of Neo Wave contains 2 plastic Bridge Size decks for marking luminous ink marked cards, with different gear and enthusiastic colors to make your game more colorful. The verse arts bring a bit of new pop culture, with young themes and a very cheerful look for you to gift someone special, even if that someone is you. NEO WAVE is the deck for you to have fun and share incredible moments. 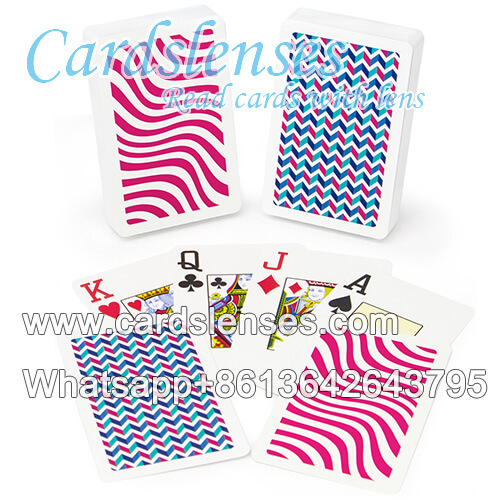 When it marks with luminous ink, it becomes magic marked playing cards with glasses, not only for show but also for cards game. Only you who with playing cards cheating devices, infrared contact lenses can see the marks you hidden.